Lourdes comes to New York from Puerto Rico and is a photojournalist here in the city. She studied at the International Center of Photography where she graduated in 2010. 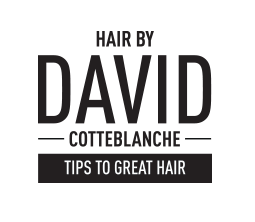 David wanted to go with a slicked-back sophisticated look for very sophisticated woman. Lourdes has beautiful facial features and this sleek, yet elegant style allows for her features to really shine through and we love that the length of her hair elegantly follows her jawline and then cascades softly around her shoulders.